You say tomato salad, I say $@@!*&?$! 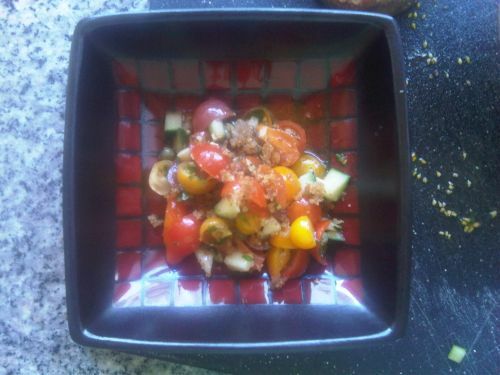 The difference between you and me is that you could make this delicious Spanish-inspired tomato salad on the first try. It’s really very simple and straight-forward. No strange ingredients. Nothing requiring more than a basic ability to read English and just a smidge of linear thinking. Me though. I put in too much of that and too little of this. Over-seasoned it all somehow, and then, for my trouble, violently sliced through the top of my thumb. And that was before I was done quartering all those cherry toms. Ouchie! It was a little soupy though. And everyone agreed: a little too tangy. Perhaps it was a portion issue. I’m famous for those. Maybe too much red vinegar or too few tomatoes … maybe my garlic cloves were too big… who the heck knows what I did wrong. Because how easy-peasy is this one? Heat 1/3 cup oil in a large nonstick skillet over medium heat. Add garlic and paprika and cook, stirring, until the garlic is fragrant and sizzling, but not brown (good luck with that) — about 20 seconds. Transfer to a large bowl to cool. Heat the remaining 2 tablespoons oil in the pan over medium heat. Add breadcrumbs, and cook, stirring, until crispy and golden brown, about 5 minutes. I let them cool off, then crumbled them into a jar for later use. Transfer the breadcrumbs to a plate. Whisk vinegar, pepper, sugar and salt into the garlic-paprika oil. 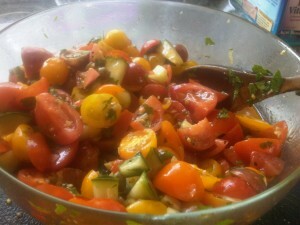 Add tomatoes, parsley, caperberries (or capers); gently stir to combine. Transfer the tomato salad to a platter and top with the fried breadcrumbs. I added some cucumber. I tried some crumbled feta cheese on top of the breadcrumbs. Naw. Of course the sample neighbor Robin brought down earlier this week was a revelation: fresh and piquant, a vibrant red. She then made savory vegetable pancakes with which to serve this salad on, and sent me a cell phone picture (which I unthinkingly deleted or I would show here…) with the come hither message: They’re hot. Come and get one. And I unquestioningly obeyed, and was rewarded with a meal I would happily have paid $20 for at any bistro in Silverlake. But that’s her. She’s in the Kitchen Goddess classes. Where I got the idea that I could make this same meal for my mother-in-law before she returned to England today has me wondering what I was smoking. Robin knows what she’s doing. She even calmly talked me through the prep. To no avail. And I ran out of time to even think about making the savory pancakes. One of the last cellphone pictures I will ever take for this blog. Promise. Lessons for next time: Don’t try this again during summer vacation, when one half of the children are in the next room screaming instructions to some fellow Halo-player in Bolivia and the other half is texting you demanding to be picked up NOW from her 48-hour playdate. And your Mother-in-law is about to board a plane in four hours, and there is a major egg recall, compelling you to keep one eye on the computer for work the whole time. Don’t do it when you don’t have a single bottle of beer to fortify you on a 90-degree day. Try it again and don’t try to season expertly or improvise with the ingredients. Just follow the damn instructions. Oh, Jules. The tricky thing about cucumbers is that when you add them to anything with salt, they weep like Mother Teresa. This may have been the cause of the soupage. Please try to make it again. I’ll have the smoky paprika waiting for you.